Abstract: MON 810 transgenic maize is the unique genetically modified (GM) maize approved for cultivation within the European Union. Prior “omics” studies on MON 810 maize in comparison with non-genetically modified near-isogenic varieties has given a broad picture on the differences between transgenic and non-transgenic maize. microRNAs are small non-coding RNAs known to regulate gene expression of several genes. Here, in these study we aimed to find differences in expression of coding and non-coding genes caused by the presence of the transgene. For that, we have performed microarrays of mRNA and miRNAs from two pairs of maize (transgenic/ isogenic). Interestingly, our results indicate possible “side effects” associated with the transgene integration into the host genome. Summary: We demonstrate that plant improvement by means of transgenesis causse alterations in the expression profiles of endogenous non-target genes. References: EFSA (2012) Opinion of the Scientific Committee on Plants Regarding the Genetically Modified, Insect Resistant Maize Lines Notified by the Monsanto Company, the Scientific Committee on Plants, European Commission, November 2012. Xinbin Dai and Patrick X. Zhao. (2011). psRNATarget: A Plant Small RNA Target Analysis Server, Nucleic Acids Research, doi: 10.1093/nar/GKR319. (http://plantgrn.noble.org/psRNATarget/). Coll A., Nadal A., Palaudelma`s M., Messeguer J., Mele´ E, Puigdome`nech P.& Pla M. (2008). Lack of repeatable differential expression patterns between MON810 and comparable commercial varieties of maize. Plant Mol Biol 68: 105–117. Coll A., Nadal A., Collado R., Capellades G., Messeguer J., Mele´ E., Palaudelma`s M. & Pla M. (2009). Gene expression profiles of MON810 and comparable non-GM maize varieties cultured in the field are more similar than are those of conventional lines. 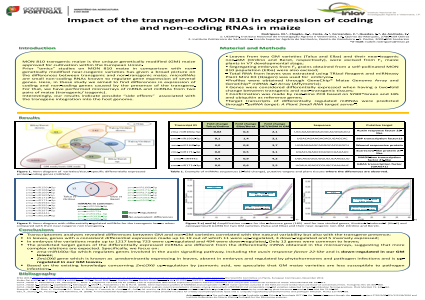 Transgenic Res 18: 801–808.